The Knights of Columbus in the twenty-first century are called to continue to be the Knights of Charity, as was the vision of venerable Fr. Michael McGivney. But they were also called to be the Knights who watch over and defend the truth. Our world, often called a “post-truth” world, desperately needs our active involvement in the defense of truth. The mission of a Knight today is to be “the light of the world” following the footsteps of our Savior Jesus Christ who said: “Then you will know the truth, and the truth will set you free” (John 8:32). Slava Isusu Xrystu! – Glory be to Jesus Christ! There is a book by an Italian author titled Siamo le persone che incontriamo which means: “We are the people whom we meet.” Indeed, many encounters in our lives profoundly contribute to who we are. In fact, the history of Christianity began from an encounter of the Master with His disciples two thousand years ago in Galilee. Whether we are aware of it or not – encounters are a fundamental part of our lives, and our existence is a repeated set of encounters. Believe it or not, from that simple “Yes”, the adventurous story of the Knights of Columbus in Ukraine began — and this also began the involvement of many other people as well. If you will allow me to say, this endeavor of the Knights of Columbus was no less risky than the historic voyage Christopher Columbus undertook when he sailed to the New World. Why? Because unlike most of the Knights of Columbus jurisdictions, Ukraine is not a predominantly Catholic country. Nevertheless, this certainly has become one of those “success stories” that began with a simple encounter and an agreement between two gentlemen. I, together with Archbishop Mokrzycki, the Roman Catholic Archbishop of Lviv in Ukraine, and four other priests, were among the first to be enrolled in the Order in Ukraine. And today, seven years later, we are witnesses to a historical event — Ukraine being granted the status of State jurisdiction, joining the worldwide community of the Knights of Columbus with equal rights and responsibilities as other members. On behalf of the Ukrainian Knights, I am deeply grateful to the Supreme Council, and, in particular, to our Supreme Knight Mr. Carl Anderson, for this recognition and for his willingness to take such a risk with our country. You know that Christopher Columbus is not such very famous person in Ukraine (like soccer player Shevchenko or world champion boxer Klichko, let’s say), but the idea of knighthood is very relevant and alive among the Ukrainian people. A knight is someone who represents higher values and is eager to sacrifice even his own life for these ideals. So when our men first heard about the four principles of the Order — charity, unity, fraternity and patriotism – they found them very close to their hearts. That is why this invitation to knighthood was, and continues to be, so attractive to more than one thousand knights in Ukraine. 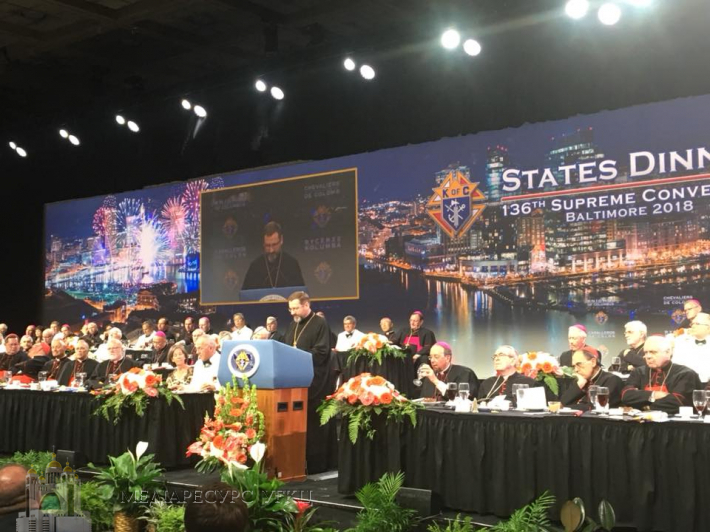 I find that it was truly providential that the first council of the Knights of Columbus was established in Ukraine’s Capital City — Kyiv, five years ago, just before the beginning of the Maidan, or “Revolution of Dignity” as we call it in Ukraine, and our Brother Knights demonstrated courage and charity by joining hundreds of thousands of other men and women who wanted to defend their right to live in a just society where human dignity would be respected. But soon after the former President of Ukraine fled to Russia, and then unexpectedly war knocked at our doors, initiated by our eastern neighbor. … It started at the moment when no one was ready for it; nobody knew how to deal with it — neither the newly chosen government, nor the people protesting in the streets, not only in Kyiv but indeed throughout Ukraine’s towns and cities. Starting with the annexation of Crimea in Spring 2014 and continuing with the occupation of the eastern regions of Donetsk and Luhansk, our country has been a victim of relentless military aggression. In the last four years, Ukraine has lost eight percent of its territory due to this war. More than one point five million people have been forced to flee their homes in eastern Ukraine, leaving behind all their property because of fighting or intimidating coercion. This war has already claimed more than ten thousand lives and left more than twenty-four thousand people injured, with unimaginable destruction. Many of our brave young soldiers returning home from the frontlines suffer from post-traumatic stress disorder. Although we do not have an exact number, we know that around one hundred prisoners, including political prisoners, are denied fair and transparent trials. The most famous of these prisoners, the renowned Ukrainian film-director Oleh Sentsov, has been on a hunger strike for nearly eighty days, demanding from Russian authorities the liberation of all political prisoners who are unlawfully imprisoned. Sentsov, the outspoken opponent of Russia's seizure of Ukraine's Crimean Peninsula, is serving a 20-year sentence on a conviction for planning terrorist acts. He denies the charges and has the backing of much of the world community. Besides all these casualties and human tragedies, there is still another hidden danger of the war in eastern Ukraine: This region is at risk of suffering a dire long lasting ecological catastrophe due to flooded mines and contaminated drinking water, which is comparable in scale to the Chernobyl nuclear reactor disaster of 1986. Experts are warning that as many as four million people might be left without safe drinking water in the region. And notice, I am not talking about the sad events of the past — all of this is happening right now, in Ukraine, the largest country in Europe, comparable in size to the state of Texas or to the country of France. The war, in fact, has already caused the biggest humanitarian crisis on the European continent since the end of the Second World War. And yet, this is a silent and forgotten war. Because it is a “frozen conflict,” no one speaks loudly about the war in Ukraine anymore. The attention of the media has been shifted, and as it often happens, to other conflict zones in the world. But we plead with the international community not to neglect Ukraine and that we not be left alone with a much bigger and more powerful aggressor. How does the Catholic Church in Ukraine, and in particular our Ukrainian Greek Catholic Church, respond to the needs of the millions of people suffering from the consequences of war? The aid provided by the Church can be summarized in one word – diakonia, that is, serving to one’s neighbor, taking care of those afflicted by the war, by providing them with spiritual guidance and often with social service as well. 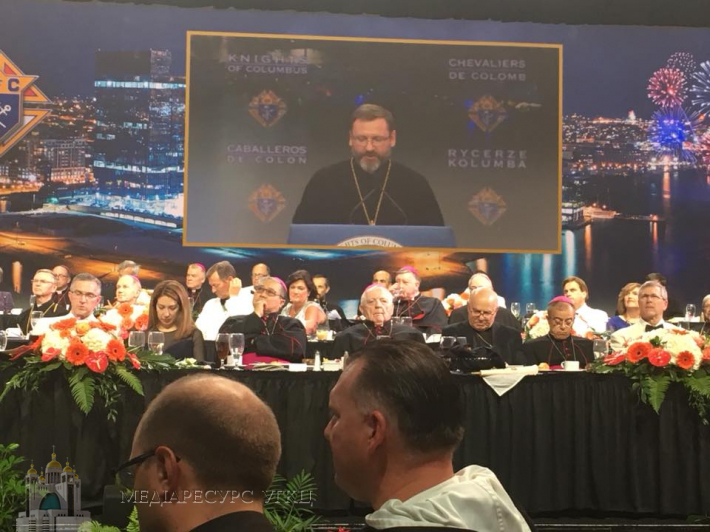 In fact, it was the main theme of the annual meeting of the Synod of Bishops of our Church two years ago when all of our Bishops from Ukraine and from throughout the world reflected on how to provide better social care to our suffering brothers and sisters who are victims of this war. Diakonia stems from charity, and charity is rooted in disinterested love for every single person. Charity is an antidote to egoism and indifference. I would say that charity is also a key to understanding the success of the Knights of Columbus in Ukraine. The Knights of Columbus in Ukraine have responded generously and wholeheartedly to the most basic need of Ukrainian society – service to one’s neighbor, diakonia. The Order has been very instrumental in mobilizing Ukrainian men to helping people in need. The first Ukrainian councils in Kyiv and Lviv immediately after the war began, started a campaign to raise much needed and urgent funds and for the purchase of first aid temporary traumatic wound treatment, like Celox, to save the lives of Ukrainian soldiers. The Knights in the city of Ivano-Frankivsk, in western Ukraine, continue to organize summer rehabilitation camps for wounded soldiers, war veterans, and their families. The Knights accompany the families of our fallen soldiers and visit wounded soldiers in military hospitals. Our Brother Knights in Melitopol, in south-eastern Ukraine, hold Christian youth summer camps located in the immediate proximity to the combat zone (less than a hundred kilometers from Russian occupied territory). The Knights in Ukraine also support priestly vocations by awarding scholarships to the seminarians unable to afford tuition fees. Along with our chaplains, they support prison ministry for young prisoners. Hundreds of physically disabled people in Ukraine have received wheelchairs from the Knights of Columbus and the Canadian Wheelchair Organization free of charge. It is truly admirable that our Brother Knights in Ukraine of both Churches — the Roman Catholic and Ukrainian Greek Catholic Churches — learn how to cooperate together, showing a wonderful example of the unity of the Catholic Church in Ukraine, so much needed in Ukrainian society today. I am really proud of the great job the Knights of Columbus are doing in Ukraine! Thank you, my dear Brother Knights, for helping us mobilize our best men to become Knights of Columbus and Knights of Charity! On this occasion, I would also like to express our gratitude to the Supreme Council of the Knights of Columbus for a generous donation given to our Churches in 2015. Thanks to this help, our local councils in Ukraine were able to purchase hospital supplies and to support internally displaced persons from the occupied territories by distributing, along with Caritas Ukraine, food and hygiene products, with a total weight of more than eighty-two tons and in the amount of four hundred thousand U.S. dollars. Also thanks to your generous donations, we are about to launch a rehabilitation center in Briukhovychi, near Lviv, where people injured during the war will be able to receive professional medical treatment. In this way, the Knights of Columbus have made a special contribution to the mission of the Church that is to comfort and to care for those who are wounded. But we also hope that, with your help, we will be able to develop the full spectrum of rehabilitation — both medical and psychological — involving thousands of professionally trained specialists who will continue to heal the wounds of the suffering ones all over our country. Our society probably does not yet realize the full scale of trauma caused by the war and that is why we, as a Church and as Knights of Columbus, need to invest so much of our energy and resources into the field of rehabilitation, in order to be able to heal the wounds of our people. I would like to bring to your attention yet another hidden aspect of this “silent war” which is happening in Ukraine. Many specialists nowadays call this war in Ukraine a “hybrid war,” that is, a war where not only traditional weapons are used on battle fields, but where all means of destruction, including economic and information warfare, are employed. Thanks to information technologies, modern wars are not limited to specific territories; they are not confined to one continent, without any consequences to those who seem to be far away. Everyone in the Western world today experiences the consequences of this information war, which targets truth by disseminating “fake news” and molding public opinion according to dishonest goals. Unfortunately, not even your country or other developed countries in Western Europe have been spared from these attacks. Please remember: it is not only our war — it is the war for humanity! Dear Brother Knights and my Dear Friends gathered here this evening, the truth is under assault today! For us Christians, truth is not a mere theoretical notion of what is right, but it is a person, the person of Jesus Christ, Who paid a high price for our salvation. If we disengage from the truth, we will be similar to a ship trying to cross the ocean without a compass. So, my brothers and sisters, we must remain ever vigilant in this battle for truth. As Saint Paul reminds us, “our struggle is not with flesh and blood, but with the principalities, with the powers, with the world rulers of this present darkness, with the evil spirits in the heavens” (Ephesians 6:12). On behalf of the Ukrainian people we appeal to you to stand up for truth, to spread the truth about the suffering and pain of the Ukrainian people, to deliver our message to the societies of the countries where you come from. We are immensely grateful to the Knights of Columbus for your prayerful and financial support, through which we were able to realize so many charitable activities. Paradoxically, because of the war, many internally displaced persons from eastern Ukraine, who used to have a hostile attitude toward the Catholic Church as a result of Soviet propaganda, have encountered the loving face of the Catholic Church, which cares for its people regardless of their ethnic background or religious beliefs. "We love you! We pray for you! Please pray for us!